What will be your first though about a Bali Wedding and how much cost for Bali beach wedding? I would imagine that most wedding couples imagine a special day on white sand beach, barefoot, turquoise sea, clear sky and sound of waves as their background music. Yes, all of those are available in Bali. However before we continue this article, you should know that under Indonesian law there are no privately owned beaches. That means that all beach fronts are for public used. How about beachfront’s hotels, resorts and villas? Yes, it applies for them too. 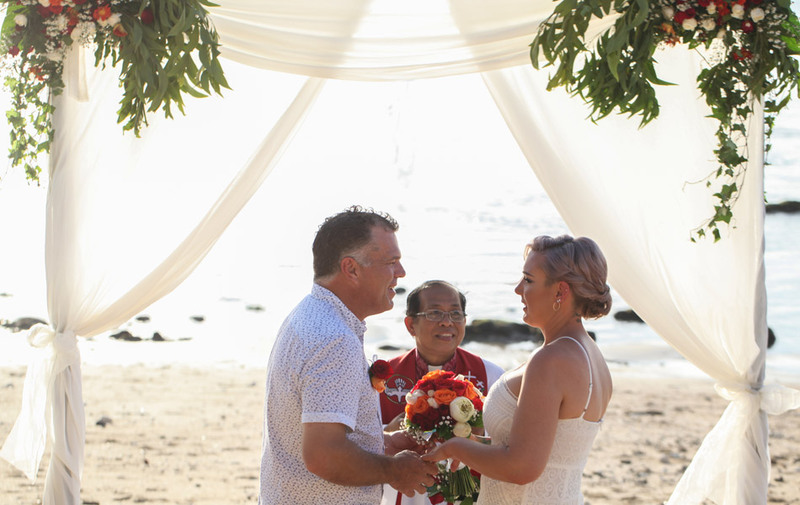 If you want a beach wedding at the hotels, resorts or villas, they may make a boundary or allocate you away from other guests/public but nobody will be able to guarantee you 100% privacy for your beach wedding in Bali. There may be always people walking down on the beach. But you do not need to worry too much, as I am sure they will have extra person to keep the venue clear from public at least during ceremony. Other considerations for Beach Wedding would be the weather. With the global climate change, it is very difficult to predict the exact weather these days. You could find rain even on dry season. So you should discuss with your wedding planner the back-up wedding venue area in case of rain. beautiful centrepiece and LOVE letter. 2 Photographers for maximum 3 hours (before, during and after ceremony/photo tour around beach) including special wedding album and all files in DVD.